Listen to this week’s edition of Local Spins on WYCE, which showcases an hour of local and regional music every week including the premiere of several new tracks. The way Valley Girl sees it, it’s all about adding different elements to the musical smorgasbord in uncorking the band’s take on indie alt-pop. “We have a unique sound with inspirations stemming from the past and present,” says guitarist and keyboard player Jake Neuchterlein. As a result, Valley Girl – Neuchterlein, singer-keyboardist Ryley Grayson, drummer Jimmy Reinhardt and guitarist Ryan St. John – has marshalled an “extremely supportive” fan base for its music over the past three years while releasing an EP, a cover of Drake’s “Hold On We’re Going Home” and its first full-length, self-titled album last September. The band – which will join The Autumnatic, Conrad Shock + The Noise and PotatoeBabies at Jake’s Music Festival in the new Elevation nightclub in downtown Grand Rapids on April 6 – cites a diverse set of influences for its songs: The Cure, Bryan Adams, Phil Collins, Peter Gabriel, Third Eye Blind. 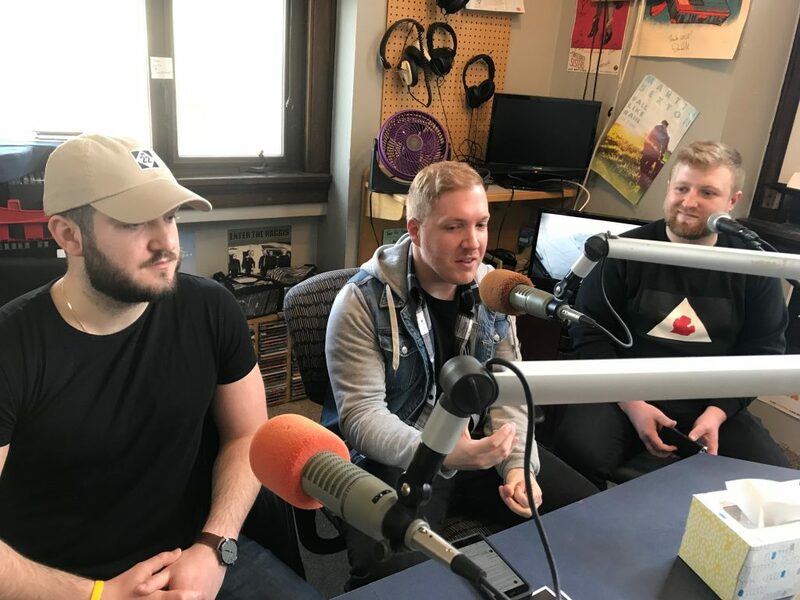 Three members of Valley Girl stopped by the studios of WYCE this week, along with Jake’s Music Festival organizer Tom Scheidel, to chat about their music and the upcoming one-day festival, which raises funds for the Juvenile Diabetes Research Foundation. Get more festival info online here. Listen to the full radio show podcast, which also features new local and regional tracks by Valley Girl, Tony Bakker & The Mercy Wheel, The Smokin’ Dobroleles, Cassidy Bisher, Trickified Poncho and The Autumnatic, along with music from The Red Sea Pedestrians (who play Salt of the Earth in Fennville on Sunday night), The All-American Funk Parade (which plays Founders Brewing in Grand Rapids on Saturday night) and Young Pioneer (this week’s musicians’ pick).